Before each family event or a holiday, I spend a lot of time planning the meal. I want everything to be special, yet not too time-consuming. When it comes to a dessert, the pressure is greater. I always look for something I haven’t made before. Be it a new recipe or a new way to decorate. My Hubby gave me all of these when I presented him this cake. The original recipe from Cook’s Country calls for cake flour to achieve a velvety texture. I used AP flour simply because I didn’t have the cake flour. I usually don’t. To substitute AP flour for the cake flour, simply subtract 2 Tbsp of flour per cup. For example: I needed 3 cups of cake flour, so I measured out 3 cups of all-purpose flour and took away 6 Tbsp from it. I decreased the sugar amount because of the addition of the frosting. The cake is dense. You can definitely taste the cream cheese in it. It’s not overly sweet. You can pair it with a fruit compote, like the magazine suggested. 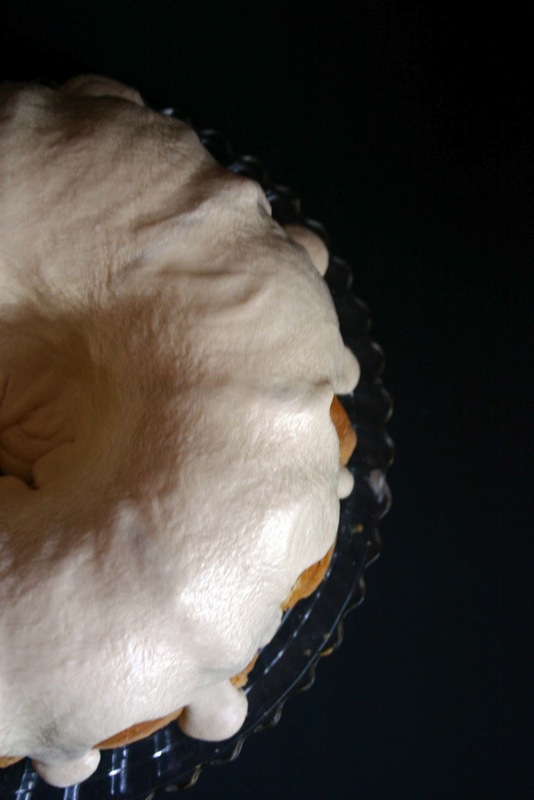 Grease and flour your Bundt pan. Set aside. In a medium mixing bowl, whisk together the dry ingredients ( flour and salt ). Set aside. In another mixing bowl, whisk together the eggs, yolks, milk and vanilla.Set aside. In a large mixing bowl, beat together butter, cream cheese for about 1 minute. Slowly add the sugar. Beat for 3 minutes until fluffy. Slowly add the egg mixture and beat until just incorporated. Add the dry ingredients, 1 cup at a time. Pour the batter into the prepared pan. Spread evenly. Bake 90 minutes, or until the toothpick inserted in the center comes out clean. I suggest rotating the pan after the 45th minute. Cool the cake in the pan for few minutes. My cake started to pull from the sides while cooling so I ran a toothpick around the top edge so it won’t rip as much. Cool additional 10 minutes. Invert the cake onto a wire rack or straight onto your serving plate. It’s nothing you tasted before. Seriously! It’s amazingly delicious – but be warned, it is addicting! YUM! Yes, I know: “the physical appearance of the “please” makes no difference…” I dare you to guess what movie this sentence comes from! lol 🙂 ). Melt butter in a saucepan over medium heat. Cook, 6 – 10 minutes, until it’s brown and has nutty fragrance. One way to know when your butter is almost done, is to wait until it stops sizzling in the pan. If you don’t hear it, that means that the butter will start browning and at this point you want to keep a close eye on it. It will brown fast. Pour it into a heat proof bowl, add sugar and vanilla. Stir until smooth. It should be quite thick, but for this cake we want it to be a drizzling consistency so we can pour it onto the cake. So add the milk and stir again, until it reaches the drizzling consistency. Pour over the cooled cake. Refrigerate immediately so the frosting will set. This looks so good! I love brown butter- it's so simple yet adds so much delicious flavor. I've really only used it in savory dishes, can't wait to try this frosting! I really hope you do try it – it's delicious! Thank you! The crumb is absolutely perfect! And I would have added icing, too!!! YUM! 🙂 Thank you so much, Lizzy! Delicious!! This sounds like a perfect cake for my next dinner party! Thanks for sharing!! That's fabulous! Thank you, Annie! Wow! That cake looks perfect! Wish I have a slice right now! 🙂 I wish I could send you some! Thank you, Tina! Everything is better with brown butter, that frosting looks amazing! I agree 🙂 Thank you! Lovely looking cake and that slice is really really tempting! Give me a cream cheese dessert anyday..I love that stuff when it turns sweet. Great post and awesome cake! The cake looks amazing. The frosting sounds great, I have never made a browned butter frosting before. I will have to try this one. Please do! It's crazy good not to 🙂 Thank you! 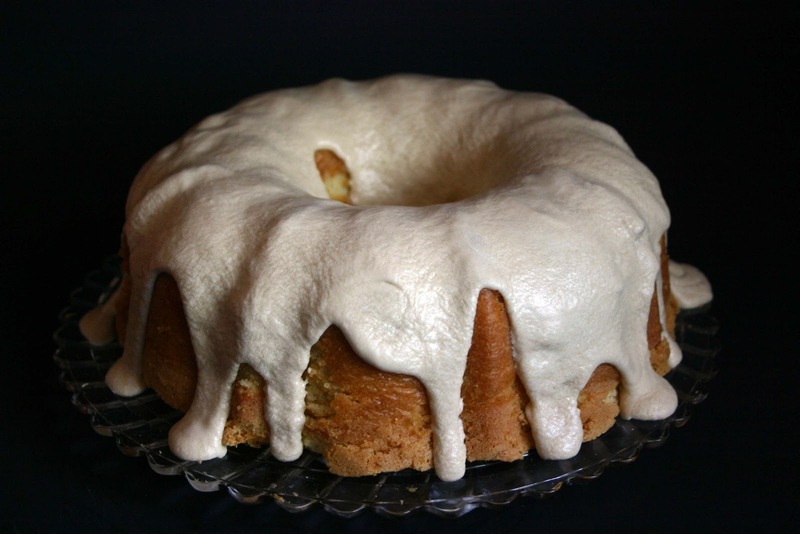 This looks so delicious, and I've been looking for a good browned butter frosting recipe! It's the one 🙂 Thank you, Kristin! Wow, the frosting alone sounds amazing…gorgeous cake! I love the brown butter frosting and it really compliments this cake. Great post! It will change your life 🙂 Crazy delicious! Thank you! I may never go back – it was so good! Thank you, Ramona! that brown butter frosting sounds amazing! love this!! So fine so good! Perfect for any occasion. Brown butter and cream cheese certainly do some amazing things to the texture and flavor of this cake! It looks so tempting, a great example of why I like these type of cakes over the layer ones-delicious! Well put, my friend 🙂 Thank you! Oh dear! Looks delish. I just love you, your blog and your recipes. Have a great weekend my friend! Dearest Tiffany, you made my day 🙂 xoxo Thank you! I made a cream cheese bundt cake last month and added orange and it was AMAZING!! 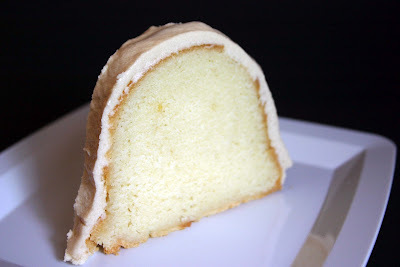 I want to make it again with your brown butter frosting which looks awesome! This looks gorgeous! Love the indulgence of the brown butter frosting. Thank you so much, Lucy! oh yummy! This looks so tasty. Oh my goodness – I want this NOW!! Browned butter frosting ROCKS. Your cake is beautiful! Oh he did 🙂 Thank you, Susie! Oh my goodness..This looks fantastic as always! You are simply amazing! I have the coffee and tea can you bring this cake? I have a linky party for blogs that I am guest hosting today you should come link up! Have a fantastic weekend my long lost neighbor;)! Sounds good to me 🙂 Thank you, Serena!